Manufactured in France from Circa 1953 until Circa 1957. 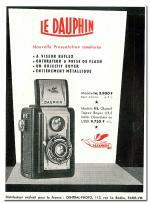 The Dauphin was a pseudo-TLR 6 X 6 (i.e. the setting of the distance is not reflected on the viewfinding, since the lens of viewfinding is not coupled with that of shooting) . It is about a basic camera. Its Boyer lens is a meniscus 11/8cm. The diaphragm has only two positions : “Cloudy” and “Sun”. The two-speed shutter: 1/25 and 1/75 secondes. The body is made of metal. It dates from the 50s (present in the "Special photography” of "Science and Vie" of 1955). 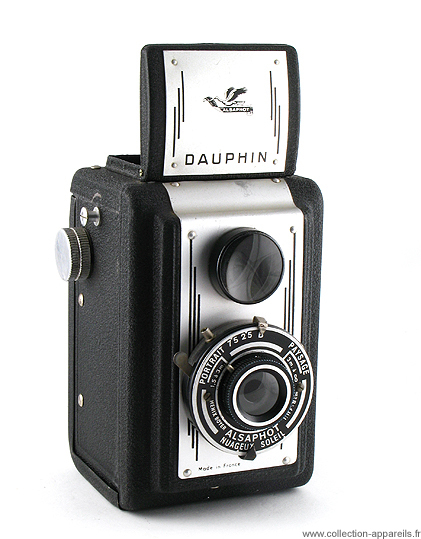 There are other versions of the Dauphin, which are characterized mainly by the lens/shutter block (Dauphin III has a lens Boyer Topaz 4,5 and one shutter going to the 1/200 secondes) and a version “ Made in Holland”. In 1953, a Dauphin I was worth 3950 francs, and a Dauphin III was worth 9920 francs.